I enjoyed this sweet, funny book about a young girl and her family. Kids and parents will laugh along as Mitzi sorts through not-so-subtle hints and comes to her conclusions. Readers will love figuring out the surprise ahead of the private-eye protagonist! Debbie Ridpath Ohi’s bouncy illustrations bring an extra layer of fun to Lauren McLaughlin’s clever story. 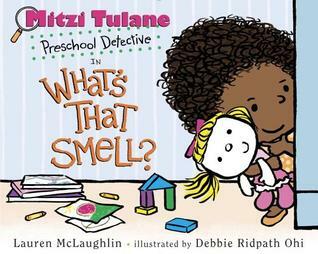 Mitzi Tulane, Preschool Detective in What’s That Smell? was written by Lauren McLaughlin and illustrated by Debbie Ridpath Ohi. It was published in 2017 by Random House Children’s Books. I really liked the idea of Mitzi being a detective to find out more about what was happening in her own house. It’s also very sweet that she turns to her baby brother, Kev, to think things through. The author has nicely shown the perspective of a young child with Mitzi’s observations and conclusions (“Everyone one in the whole wide world was standing in Mitzi’s living room.”) The illustrations follow this same perspective and most scenes depict the world around Mitzi from her eye level. I also enjoyed the subtle humor that often seemed designed to give adult readers a chuckle. I don’t often come across fiction picture books that focus on the sense of smell, and I liked the concept of using it to solve a mystery. This different way of telling a story about a birthday was refreshing. The illustrations show diversity in the skin colors of family members, and it was interesting to read interviews with Debbie that explained the reasoning for her artistic choices (http://debbieohi.com/bk-mitzi-creation/). Draw a picture of your own birthday party. Who was there? Go on a “smelling walk.” Use your nose to smell what’s in the air around you and try to identify what you are smelling. What is your favorite smell? Draw pictures or make a list of smells you like—and smells you don’t like. Check out the Teacher's Guide on Debbie Ridpath Ohi's site for more activities. I like the idea of her being a detective too. Sounds unique in picture books. Wish this was around when my daughter was younger. Ooh fun! Nice one to pair with Betsy Devany's book LUCY'S LOVEY about losing her doll, Smelly Baby. ;) Nice PPBF choice. I haven't read that one! I'll have to check it out! I really love how young the protagonist is in this book. And a smell detective is a pretty cool idea. I like the idea of a 3-year-old detective with a nose for a mystery! It sounds very humorous! Lots of good things about this book, including making the reader feel "in the know" as the MC works to solve the mystery. Great fun for kids. And, I, too, love the use of the sense of smell, something we often forget to use in our writing. Thanks for highlighting! This is interesting and I look forward to finding it in my library. Thanks for featuring it! I love detective stories - especially those that inspire kids to use their senses. This looks fun. Beautiful story with such a cute mc. Loved that she is a detective investigating what's happening in her home. Fun for all the kids. Thanks for sharing. Sounds like great sensory fun! Thanks for sharing!